Sharks-N-Shooters in Rocky Mount, North Carolina hosted the ninth stop on the 2008-2009 Jacoby Custom Cues Carolina Tour May 16-17. A talent-laden field of forty players competed in the $1000 guaranteed added Main Event. 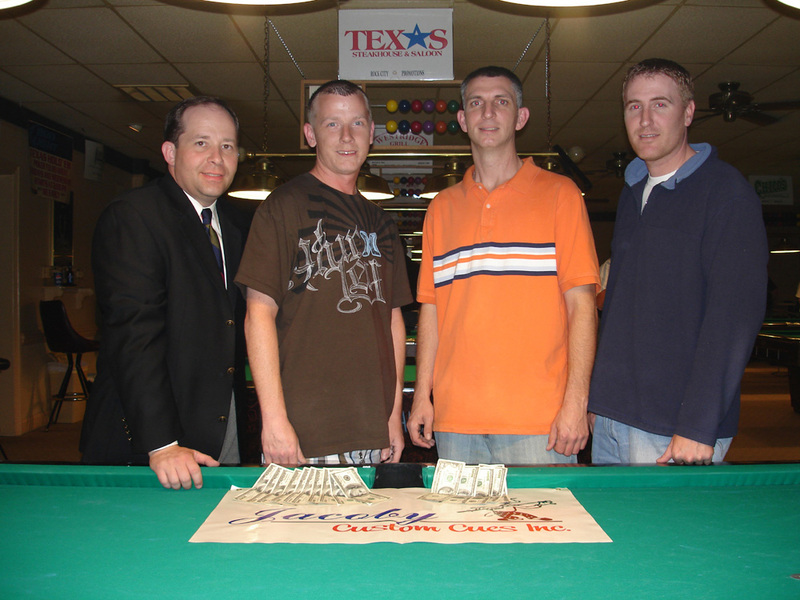 Keith Bennett defeated Steven Page in the final match, earning $1000 for first place. Bennett has won three out of the last four events on the Jacoby Tour. The festivities began on Friday night with a Pro/Am Tournament that featured the likes of six-time World Champion Earl “The Pearl” Strickland, WPBA Hall of Famer Belinda “The Texas Belle” Calhoun, two-time U. S. Mosconi Cup representative Mike “Babyface” Gulyassy, three-time Virginia State 9-Ball Champion Cary “The Southern Gentleman” Dunn, 1998 Armed Forces Champion Robert “Razor Ray” Ray and former players of the year on the Jacoby Custom Cues Carolina Tour Michael Fuller and B. J. Ussery. After a catered Meet and Greet Social, a select few VIP amateurs were paired with the professionals in a Scotch Quads 8-Ball Round Robin. For two and one-half hours, it was fun-filled chaos and mayhem as each team tried to make as many balls as possible in the time allotted. After the dust settled, it was Team Allen Riley Photography that came out on top. Winning team members included Jackson Jeffreys, Jay Jeffreys, Justin Love and Brian Floyd, plus their team captain/pro Cary Dunn. Each received $25 gift certificates to Westridge Grill, a local restaurant. A professional photographer took team photos as well as candid shots throughout the evening and a camera crew was on hand from local TV station WHIG-TV to get footage for a future broadcast of the event. On Sunday, there were three mini-tournaments. First place in the Junior Tournament went to Jackson Jeffreys, who defeated Patrick Pipkin (9-5) in the final match. Both qualified for Junior Nationals by finishing at the top of their respective divisions. Top honors in the Ladies’ Tournament went to Karen Webb, who defeated Lea Andrews (9-2) in the final match. In the last mini-tournament on Sunday, Bill Duggan took first place in the Second Chance Tournament, defeating Mac Harrell (7-2). Results of this event were: 1st Bill Duggan, $120; 2nd Mac Harrell, $60; 3rd and 4th Mike Walker and Russell Sasser, $30 each. In the Main Event, Bennett receive a bye in the first round and then earned the hotseat as a result of victories over Stephen Skvarka (7-1), Willie Simpson (7-1), Michael Fuller (7-3), Eddie Little (7-5), Earl Strickland (7-6) and Steven Page (9-5). Meanwhile, Page also had a bye and then defeated Chico Colon (7-4), Mike Cone (7-2) and Qi Liu (7-3) before being sent to the one-loss side by Earl Strickland (7-5). Page came back on Sunday focused and determined. He brought down Sam Monday (7-5), sent Eddie Little packing (7-2) and avenged his previous loss to Earl Strickland (7-5). In the final match, a single race to nine, Page won the lag, but came up dry on the break. He had a couple more opportunities at the table, but Bennett took the first game and the next two. Bennett enjoyed leads of 5-1 and 7-2 and kept Page on his heels for much of the match. Page got as close as 7-5, but Bennett took ball-in-hand in the thirteenth rack and cleared the table. On the hill, Bennett broke and ran to close it out. Final score: 9-5. On Saturday evening, WPBA Hall of Famer Belinda Calhoun entertained the crowd with a Play-the-Pro session in which fans had the opportunity to challenge Calhoun in a game of pool. Everyone who participated received an autographed photo of Calhoun and a chance in two drawings. Ray Richardson won a 9-ball that was signed by the top three finishers in the Main Event and Matt Highsmith won a 30-minute player analysis with Calhoun, a certified instructor with Colliding Spheres. Prior to the semi-final on Sunday, WPBA Hall of Famer Belinda Calhoun entertained the crowd with a Play-the-Pro session in which fans had the opportunity to challenge Calhoun in a game of pool. Everyone who participated received an autographed photo of Calhoun and a chance in two drawings. Jacki Duggan won a hat that was signed by the top three finishers in the Main Event and Bill Duggan won a 30-minute player analysis with Calhoun, a certified instructor with Colliding Spheres. Congratulations to cue raffle winner Dennis Joyner, who was the lucky winner of a Limited Edition cue, valued at $850, from Jacoby Custom Cues and to B. J. Ussery, who outlasted fifteen other participants to win $205 in the Break Contest. Rock City Promotions wishes to extend special thanks to the staff and ownership of Fast Eddie’s Sports Bar, home of the Carolina Open, and to OB-1 Cues for supporting the Jacoby Tour. The next stop on the Jacoby Custom Cues Carolina Tour will be June 13-14 at Family Billiards in Burlington, NC. The event will guarantee $1000 added with $1000 for 1st place. Also, top Junior Tournament finishers in both of the boys divisions will automatically qualify for Junior Nationals. Story and photo courtesy of Rock City Promotions.